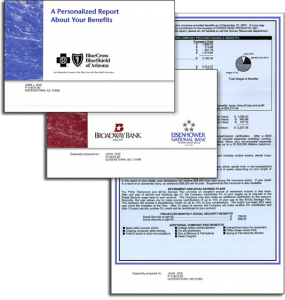 About Your Benefits offers several standard statement designs with numerous custom variations available. Our designs are attractive and personalized with your company’s logo and identification. Our standard statement offerings are show below. Actual samples will be provided when you request additional information. This 8 ½” x 11″ or 8½” x 14″ statement may be single-sided or duplex color laser printed. These statements fit into a standard No. 10 window envelope. Another standard offering is our 11″ x 17″ Single Sheet Self-Cover color laser printed and folded in half to create a four-page 8½” x 11″ statement. 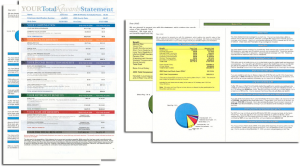 9″ x 12″ window envelopes are included with these statements. 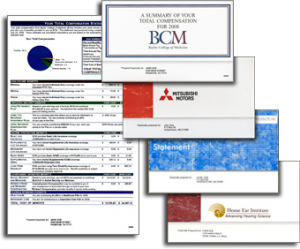 This 8″ x 14″ single page fits into a window envelope for mailing or internal distribution. 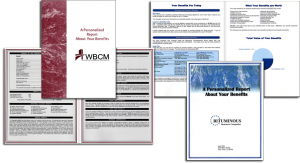 This compact design offers a personalized summary of the highlights of your employee’s compensation and benefits program. These statements designs include a 8½” x 11″ booklet with die cut cover or self-cover. 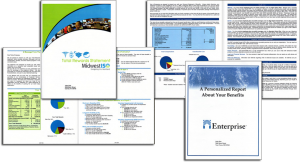 Window envelopes are included with all About Your Benefits statements. 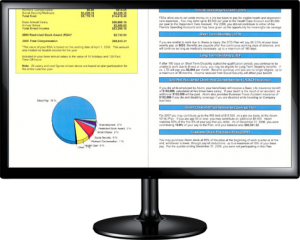 About Your Benefits has the capability to laser print statements (simplex or duplex) on up to 11″ x 17″ stock, which offers you considerable design flexibility to create custom variations on the standard styles described above. Custom graphics and color are always available for a slight surcharge over our standard offering. Online statements provide a year round source for personalized employee benefits information. Employers may prefer this method of keeping employees up to date on the value of their benefits.